The Zeppelin Air is the latest incarnation of Bowers & Wilkins premium iPod sound system (calling it a dock just seems so inadequate). As its moniker suggests, this model incorporates Apple AirPlay technology, allowing users to wirelessly stream music direct from an iTunes PC or an Apple iOS device. However, while it may look like the original Zeppelin with AirPlay bolted on, it's a significantly different beast beneath the surface. This is a beautifully crafted piece of kit. Aesthetically, it follows the same distinctive rugby-ball lines as the original Zeppelin: large at 640mm wide and a weighty 6.2kg. The 30-pin iPod docking port is centred placed, with other connectivity nestled between two rear-facing bass ports. It's here you'll find an Ethernet LAN, auxillary minijack input for both analogue and digital audio sources, USB PC connection and composite video output. The latter is used to route JPEGs and movies to a display. AirPlay devices are designed to be easy to use. Unfortunately, our first attempt to network the Air failed; the stumbling block appeared to be a Virgin Media-supplied Netgear router. A secondary network built around a BT Home Hub was far more accommodating. We relate this merely to warn some potential buyers than installation may not always be a painless experience. Anyhow, once recognised by our network, a tiny status light on the Air glowed purple in contentment. 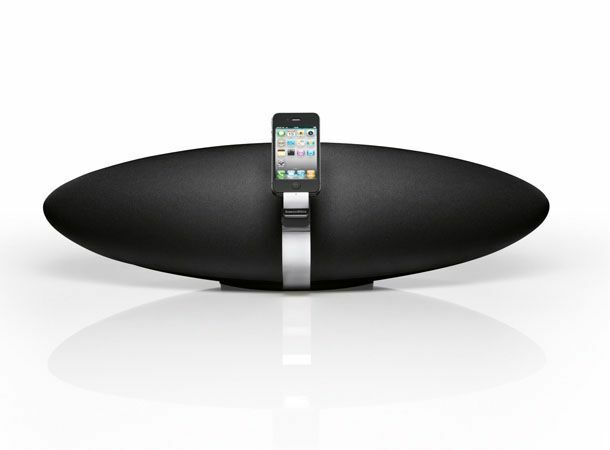 This Zeppelin can certainly move air, going loud enough to rock a decent sized room. The unit borrows the 25mm Nautilus tube tweeter design (and doubtless some matching DSP wizardry) first seen on the brand's MM-1 PC speakers. Behind each tweeter and 75mm mid-range driver sits a 25W amp module; the Air's125mm subwoofer has its own surly 50W engine. Vocal clarity is excellent and the depth of bass stunning, given the physics of the box. Pop, dance and rock prove to be perfect partners. Paramore's All We Know combines clean, clear vocals with hard choppy riffs which the Air relished at volume. MCR's Bulletproof Heart demonstrated its prodigious bass output, which was surging yet controlled. However, the system struggled to create scale with more expansive pieces, such as At the End of the Day from Les Miserables. The system may be punchy, but it lacks wide stereophony. The soundstage is crampt. It's a bit like facing off with your favourite band down a narrow corridor. But given the form factor, what would you expect? During our audition, the Air occasionally lost its connection to a paired iPod Touch, bringing our imaginary party to an impromptu halt, but for the most part the connection was stable and responsive with only marginal lag between control and execution. Ultimately, the Zeppelin Air is a compelling performer. The electronics and drivers are arguably better than we've seen on any previous Zeppelin and the addition of AirPlay is inspired. That the system begs comparison with more traditional hi-fi systems says a lot about its musicality. The catch, of course, is that it's expensive. For just £100 more you could bring home the entire Denon AirPlay CEOL system and, the original Zeppelin (which we awarded 5 stars to in 2008) is now an enticing £399, although the Air offers improvements under the bonnet as well as AirPlay support.